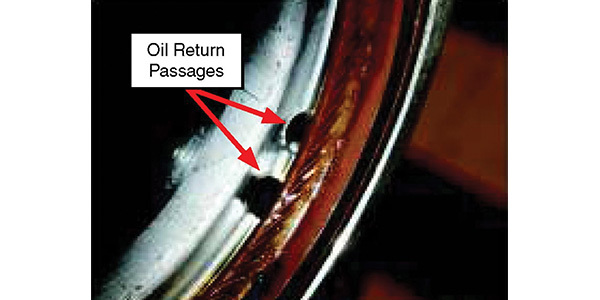 Subaru has updated the procedures and tools needed to enhance retention of the oil seal and eliminate any chance of blocking the oil return passages in the timing chain cover (see Fig. 1). Always make sure the seal bore in the cover is clean, dry and free of any fluids or contamination. 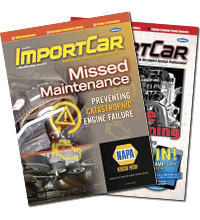 Do not apply any oil or sealer to the outside or inside of the seal or seal bore in the timing cover before installation. 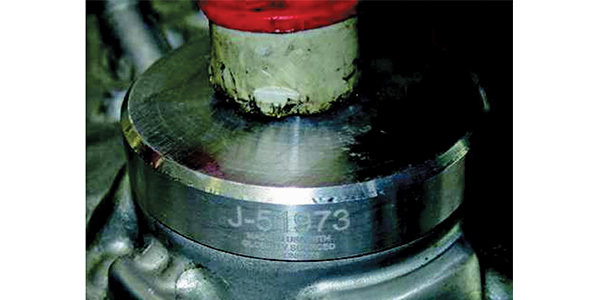 When installing the seal into the timing cover, the proper seal installer must be used with the part number S/T # J-51973. Whenever removing the crankshaft extension, the O-ring on the extension must always be replaced during reassembly as it is a one-time use part. Carefully tap the new oil seal into position, flush with the face of the timing cover as shown in Fig. 2, using a plastic hammer and the specified installation tool. Tip: Use a piece of cardboard against the radiator cooling fins as extra protection again damage from the hammer.